Get good grades. An impressive transcript is essential, so it is important to get good marks all four years of high school. Monitor your child’s grades, offering help when needed. If you her grades start to slip, meet with teachers or guidance counselors to find out what the issue is and how you can help remedy the problem. Take challenging courses. College prep courses, AP courses and honors classes really look good on a college application. In most cases, it’s actually better to get B’s in an AP class for example than to get A’s in a standard class. The reason? Students learn more in challenging courses, and colleges look for them in transcripts. Focus on subjects of interest. It’s not necessary for your child to take every course offered. Have him focus on the ones that he is genuinely interested in so he has a greater chance of succeeding. With that said, there are certain courses that have more value placed on them by college admissions: History, English, Math, Physics, Chemistry, Philosophy, Biology and foreign languages. Get the help of a tutor. A Chicago tutor can help bring up low grades and hone your child’s study skills. A professional tutor can help give your child the extra attention that she may be lacking in a classroom full of other students, helping her bring up any slipping grades. Practice the ACT. Becoming familiar with the material and types of questions that will be on the ACT can help raise those test scores. Take advantage of the many free online practice exams like the one found here. You may also consider enlisting the help of a tutor to help your child prepare correctly. Consider requesting an extended time ACT. If your child has a verified learning disability, you can request a time extension here. Students with learning disabilities are granted 50% more time, but scores are valued the same as regular tests. Go beyond the classroom. To make a college application stand out, it is important to distinguish yourself beyond the classroom. Colleges look for students who have a particular talent such as athletics or music. These extracurricular activities also demonstrate an interest in overall learning, which colleges tend to value. But don't overdo it. Don't encourage your child to join a bunch of clubs just because you think it will impress the college admissions. Your child should join clubs or activities because he truly is interested in them. It is better to have a few extracurricular activities that he loves and shines in than it is to be a part of a dozen clubs that don’t interest him at all. Get teacher recommendations. Admissions placed value on teacher recommendations more than any other letters. That is because colleges want students who professors are going to enjoy teaching. What past teachers say about a student means a lot, so have your child ask any teacher or counselor they are close to for a written recommendation. Limit the college talk. Lastly, do not put too much pressure on your child. Do not let the process of applying for college completely consumed your family. You and your child should set aside time each week to discuss and reevaluate how the process is going, but placing too much emphasis on it will only stress everyone out. 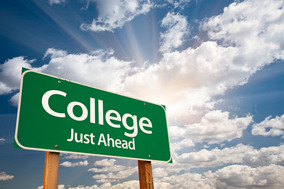 Preparing for college applications begins when your child starts high school. Getting good grades throughout high school, being involved in outside activities and preparing correctly can greatly increase your child’s chances of landing a spot at the college of his dreams. These 10 tips are things you can do to help him along. Does your child need academic or test prep help? Contact Chicago Academic at 773-466-0101.